The new congressional districts in southeastern Pennsylvania under the map imposed by the Pennsylvania Supreme Court. HARRISBURG — A panel of federal judges, asked by GOP lawmakers to block the new Pennsylvania congressional map, on Friday questioned whether it should wait for the U.S. Supreme Court to act on a similar request and if blocking the map would further disrupt an already tumultuous election cycle. The three judges — Chief U.S. District Judge Christopher C. Conner for the Middle District of Pennsylvania, Judge Kent A. Jordan of the U.S. Court of Appeals for the Third Circuit, and District Judge Jerome B. Simandle for the District of New Jersey — were equally aggressive Friday in questioning both sides in the case during four hours of testimony. They said they would release a decision soon. A group of eight congressmen and two state Senate leaders, all Republicans, are seeking a preliminary injunction to stop implementation of the congressional map imposed last month by the state high court, arguing that the court stole power that the Constitution gives to state lawmakers. "The U.S. Constitution assigns responsibility for redistricting to the legislature," Jason Torchinsky, a lawyer for the Republicans, said at the hearing. The justices of the state high court, he said, "don't get to act as legislators" by creating criteria for how congressional district lines should be drawn and then creating their own map. Torchinsky and other lawyers for the Republicans argued that the federal judges should reinstate the previous map for the 2018 elections, including the primaries in May and the general election in November. That would mean holding another election cycle under the 2011 map that was discarded in January, with the state Supreme Court ruling it was a partisan gerrymander drawn to favor Republicans in violation of the state constitution. At the core of their arguments, Republicans say, is that the state court overstepped its bounds. The new map's defenders, including Gov. Wolf's administration and the Democratic voters who brought the original state lawsuit, contend that the federal courts have no power to step into a state constitutional issue. Beyond those basic arguments, Republicans have contended that the new map has created a chaotic environment that has confused congressional candidates and voters. 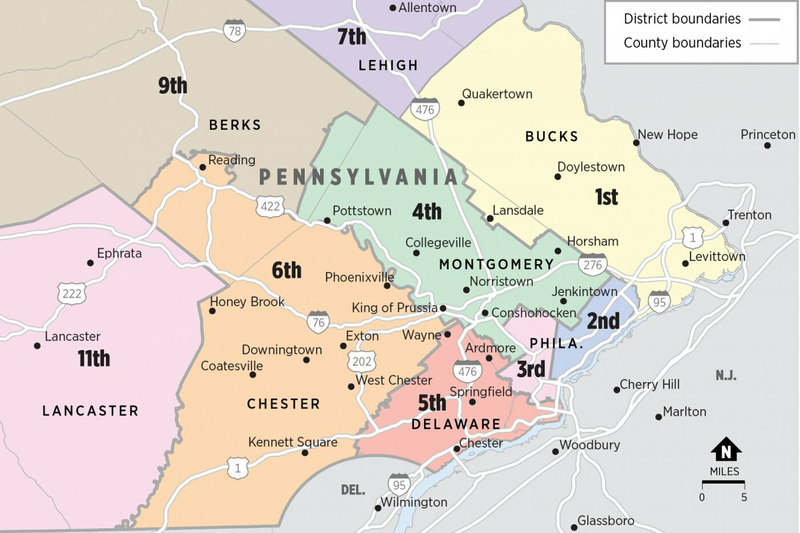 The judges appeared at first to be sympathetic to that idea, with Conner referring to "a kind of the chaos" that a Pennsylvania Supreme Court justice said would ensue after a new map was drawn. But then the judges flipped that around: Might a return to the previous map actually create more chaos? "Do we make the confusion better by issuing an order that says you're back to the old map?" Jordan asked. The judges also appeared concerned about the timeline of events, since the Pennsylvania Supreme Court did not release a full opinion explaining its ruling until Feb. 7, two days before the deadline it imposed on the state legislature to draw a new map. The judges noted that the full opinion contained more information that would guide the drawing of a map, questioning whether that meant the legislature in effect only had two days to draw a map rather than 18. They also raised the question of another challenge currently before the U.S. Supreme Court, in which the state's two top Republican state lawmakers are asking it to block the map. Both challenges make similar legal arguments, the judges noted, and the U.S. Supreme Court is considering other gerrymandering cases this term. One option, the judges said, is to wait for the Supreme Court. U.S. Supreme Court Justice Samuel A. Alito Jr. is expected to issue a decision at any time as to whether the high court will take up the case and block the map, or reject the request and leave the map in place.